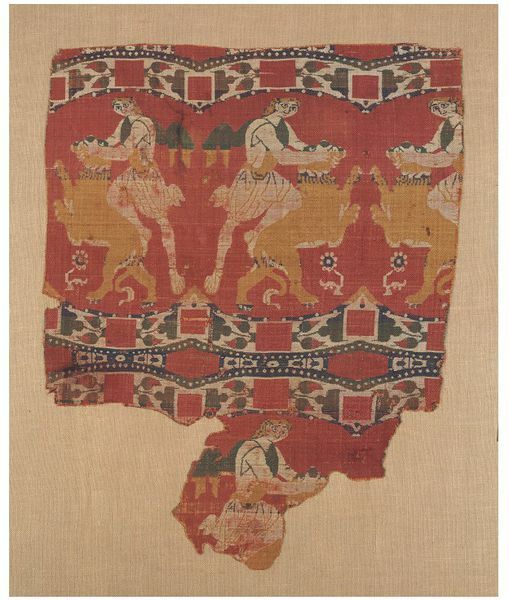 The scene on this textile and the related piece (see image) of a man wrestling a lion, represents the symbolic theme of man's victory over animals. A number of these 'lion-strangler' silks have been found in western Europe, some of which can be firmly dated to the period given. The survival of at least seven silks with similar patterns suggests that they must have been in considerable demand by the wealthy and powerful. They would appeal to a wide group of 'consumers' as the image can be variously interpreted as that of the Christian figures Samson or David or the pagan, classical hero Hercules. The context in which this and the related piece were found, in a Cathedral in Switzerland, suggests that they were seen there as having Christian symbolism. Woven silk with 'lion-strangler' design; silk compound twill. The group is reproduced facing alternately to left and right in horizontal rows. Undulating border strip above and below horizontal rows of the design. Dark blue, green, yellow, red and white on a red ground. Acquired by the Museum from the Bock Collection. Historical significance: This type of scene probably influences Romanesque art. Typical of the textiles sold by Bock to many different European collections. The scene represents the symbolic theme of man's victory over animals: a hero or gladiator wrestles with a lion. The figure portrayed may be that of Samson or David, or the classical hero Hercules, thereby satisfying the Judeo-Christian or pagan observer. The man is depicted in Hellenistic-Byzantine style and wears a classical short tunic and a chlamys or cloak over his shoulder. Medieval, Byzantine features are present in the rather rigid and ungainly stance of the combattants and the stylised floral forms. The broken circles above and below the figures suggest that the design was adapted into a frieze from a series of roundels, a familiar method of composition used in both Byzantine and Near Eastern textiles. The border pattern has been arbitrarily broken by the scalloped arrangement, so that it is incompletely shown: it represents a rose-stem with blossom and two buds. This design, which is frequently found on early medieval silks, was a stylised development of the naturalistic floral forms used in the late classical period. At least seven extant textiles of 'lion strangler' silks have been found in Western Europe, mostly in a religious context, although their precise function there is not known. The choice of design might have been superstitious or religious. The survival of these silks with similar patterns suggests that they must have been in considerable demand by the rich and powerful. The designers were most likely either trained in the Byzantine tradition or strongly influenced by it. The design looks back to classical prototypes, and its model may have been one of the scenes of Hercules. The slight stylistic variations between designs on other Samson silks suggests that several workshops were probably weaving similar designs. The predominant role of Byzantium and the Islamic Near East in textile production and trade in the Mediterranean was not superseded by Venice until the 13th century, due to two basic interrelated factors: maritime supremacy in the Mediterranean and the conquest of Constantinople in 1204. Canon Franz Bock (1823-1899), a German was one of the most ubiquitous collectors of the second half of the nineteenth century. He bought many fragments of medieval silk from - or was presented with them by - many ancient cathedrals and religious foundations andhe subsequently sold them to major public collections in Europe - the South Kensington Museum, Paris, Lyon, Vienna and Berlin. So, there there are often pieces of the same silk in geographically separate places. Muthesius, Anna, Byzantine Silk Weaving: AD 400 to AD 1200 (Vienna: Verlag Fassbaender, 1997), pp. 65-74, pl. 21a. Williamson, Paul, ed., The Medieval Treasury: The Art of the Middle Ages in the Victoria and Albert Museum (London: V&A publications, 1986), pp. 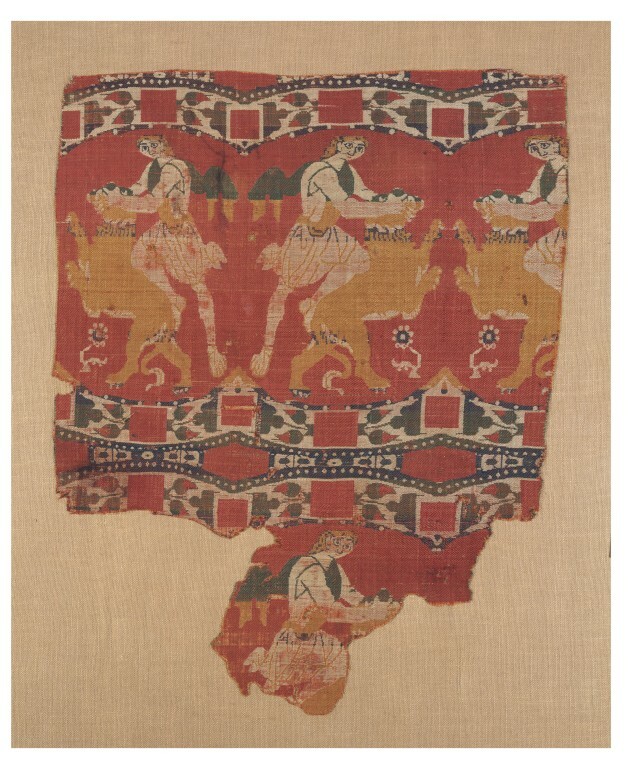 80-81, ill.
Woolley, Linda, 'A Mediaeval Treasury: The Figured Silks in the Victoria & Albert Museum' in Hali: The International Magazine of Fine Carpets and Textiles, pp. 20-27, pl. 6. Baumstark, Reinhold, ed. Rom und Byzanz: Schatzkammerstücke aus bayersischen Sammlungen (Bayerisches Nationalmuseum: Hirmer Verlag, 1998) pp. 122-124. 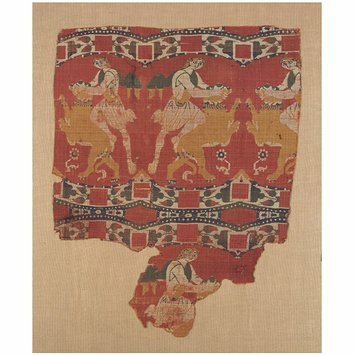 These types of silks were woven in several centres around the East Mediterranean. This and the related piece were found in the Cathedral of Chur in Switzerland.